STEP 1. ESTIMATING THE LENGTH OF DRAIN HOSE. 1 When there is no threshold (barrier) ,the length of the drain hose should not exceed 3m. 2 When it is necessary to connect the drain hose with the drain outlet located far away, connect the extension hose and applicable parts (available from dealers or service centers). 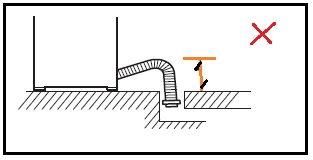 3 Do not install the drain hose where it must extend over a threshold of 5cm or more ; do not install where there is a threshold(as shown above) and the hose must extend for more than 2m. 4 Do not put the end of the drain hose into the water. 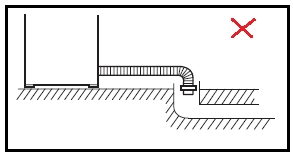 5 Do not place the hose below the floor level of the drain outlet. 6 Do not make the mid part of the hose positioned higher than the ends.